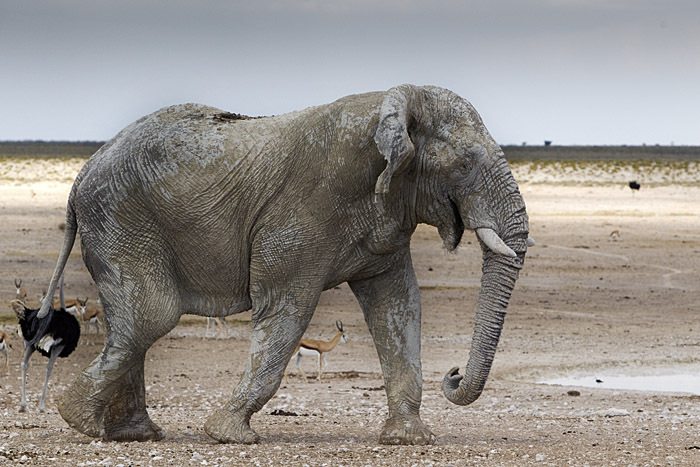 The hot dry season in Etosha can be very hard on its animals. Close to the pan, the once verdant expanses of grass velds begin to look like over-baked bread crusts. Herbivores living on this parched landscape have to walk long distances for little purchase, and even then what they find is low on nutrients. They wait for the rains, which bring the plants back to life from their dryness-induced dormancy. Before the time of man, most of these animals would have perhaps moved on to greener pastures, primarily driven by their search for surface water. 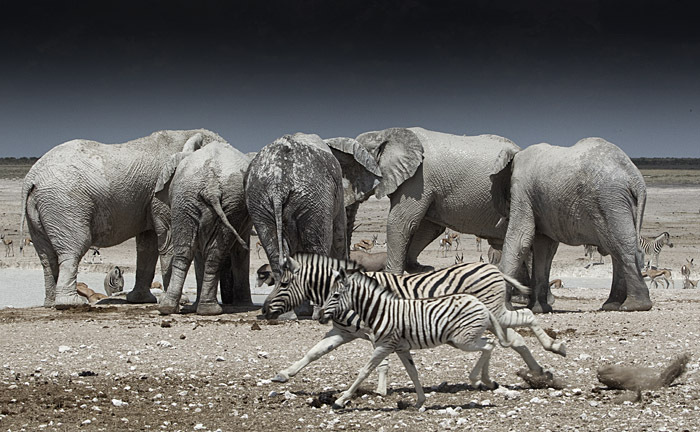 Arid adapted herbivores, like gemsbok and springbok, and most carnivores may be able live without surface water, but zebra, elephants and rhinoceroses must have water. With manmade fences around the park these days to protect private farms from wildlife invasion, there’s a need to keep the animals within the park boundaries — no matter what. The solution to entice animals to stay with park boundaries was to provide them with surface water. Manmade waterholes dot the park roads and it is at these waterholes that the struggling animals provide entertainment to holidaying humans on safari. The Nebrownii waterhole, named after an Acacia nebrownii bush found in the area, is my favorite spot in the park to spend a hot afternoon. The large manmade watering hole is surrounded by pure aridity for much of the dry season, and is hence largely deserted for much of the day. However, for a few hours every afternoon, under the intense heat from the midday sun, the waterhole has its peak usage. There are countless zebra, ostrich, gemsbok, springbok and wildebeest in attendance. However, the only thing that makes me sit there in the 40C/100F heat is the prospect of watching the antics of the bull elephants! 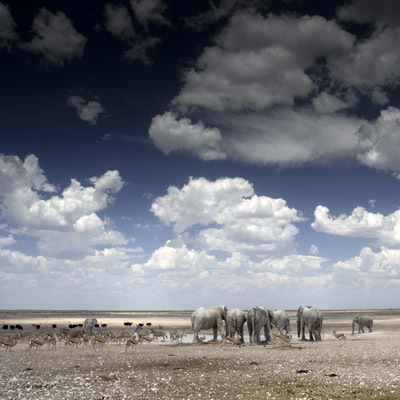 The elephants in Etosha are among the tallest elephants in the world, and in the Okaukuejo area the bulls are often coated with the white dust from the pan which makes them look like large moving blocks of granite strolling though the savanna. Elephants are not always interesting to watch because they spend so much of their time eating. However, things get exciting when they are near water, or there are little ones in attendance. The most interesting part of seeing elephants in Nebrownii is the almost guaranteed presence of many bulls on hot afternoons during the dry season. 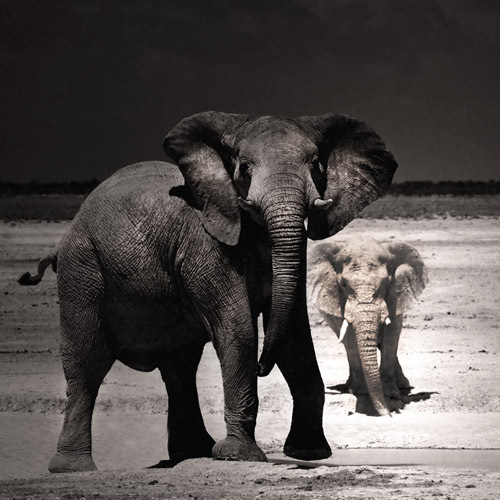 This is somewhat unusual because of the common perception of bull elephants being loners. However, when you see seven or eight bulls hanging out together at this waterhole, it definitely debunks that perception and opens up a new world into lives of bull elephants. 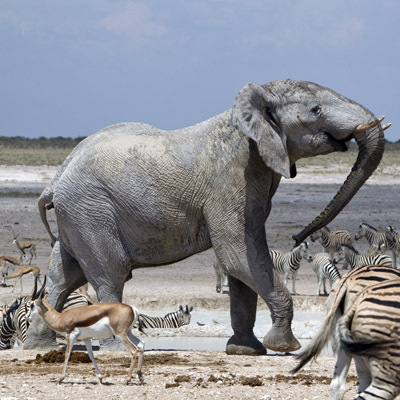 In fact, there’s been a recent study of bull elephant behavior in the Etosha National Park that shows that there is a strong linear dominance hierarchy in such gatherings (C.E. O’Connell-Rodwell et al 2011). While I wasn’t aware of this scientific paper until recently, it was easy to enough to see the dynamics even in a non-scientific observation. After watching these bulls for several hours nearly every day for two weeks, I could recognize each of the seven bulls that could be regularly seen at the waterhole. Four of the seven bulls are in their prime and one of them is clearly the most dominant. Two of the bulls are noticeably old and have a distinctly labored walk, and one is a very young bull that usually follows the old bulls to the water. The young bull walks to water in a distinct swagger. He shows the smaller animals like zebras and springbok that he is boss as he sprays them with water, trumpets and growls at them. He charges at them, but is never swift enough to catch them. He means trouble and he is desperate to show that he means business. While the young bull is busy showboating, the older bulls stay calm as they savor their time with water. The young bull continues to behave in this fashion until the first of the bulls-in-their-prime make an appearance, when he has to suddenly behave! And behave he generally does as his showboating self is suddenly subdued. 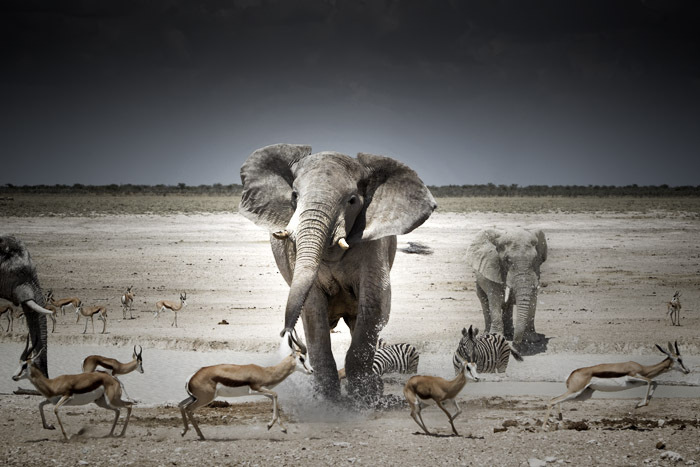 There was only one time in which he was chased by a bigger bull and given a trunk “punch” on his back, but apart from that the young bull is very quiet in the presence of the big bulls. The harsh light of the midday sun on the near-white surface around the waterhole produces some rather unflattering tones in the photographs, and it is never a great time to be out photographing at that time of the day. However, I do like to document anything that I see which means I always have a camera, or two, next to me, just in case an interesting opportunity presents itself. While I usually get plenty of action photographs like elephants spraying water, making threatening displays or harassing smaller animals, top on my photography wish list to somehow depict the contrasting behavior of the young and older bulls. The waterhole is also usually very crowded, so there would always be an out-of-focus zebra back, a springbok horn or something else equally distracting in any photographs of the elephants. This means that getting the elephants alone in a frame is a near impossible task. In the thousands of photographs that I have from the several days at the waterhole, only a handful of sequences are good enough to graduate to the processing stage. And even then, the colors are flat and the contrast harsh. On one of the days, I had taken up my post-lunch spot as usual. The white monoliths breaking the green tree line in the distance confirmed that the bulls would show up on time. There was an unusually small gathering of herbivores when one of the older bulls, followed by the young bull, made their way to water. If I was to get any photographs of a combination of the bulls or their interaction without much distraction then this would be the time, I thought. I set both my cameras to burst mode, and put a telephoto lens on one camera and a wide-angle lens on another. With the young bull drinking water in the foreground and the old bull drinking water in the background, there were some interesting photographs of the two bulls. However, none of the photographs showed the nature of the two bulls like I wanted to show. The small bit of luck I was looking for came in the form of a bold springbok that ventured too close to the young bull. In an instant, the young bull flared its ears, twisted its tail and raised its head up — ready to charge and defend his water. The springbok got the message and moved away. It all happened so quickly. I had a dozen photographs from the three-second sequence and reviewing the photographs revealed that I had one photograph that truly represented the nature of these bulls perfectly. What a difference age makes! The bulls drinking water, while zebras run in the foreground. The young bull has to wait for his turn. The Seven Bulls of Nebrownii.